Photo courtesy of Nicole Castro-Valdez. Meeting WCU student Nicole Castro-Valdez is like sitting outside on a sunny spring day; she has a bright, contagious disposition that makes people smile. Castro-Valdez is a senior criminal justice major who traveled to Guatemala in May, 2018 as part of the non-credit, study abroad program WCU Summer in Guatemala: Cross-Cultural Educational Experience. According to WCU’s study abroad program directory, the aforementioned program facilitates service-learning through a two-week long, faculty-led trip. The program description reads, “In Guatemala, students will have an opportunity to actively engage in the community to make a direct impact on those within special education schools. Not only will students develop an emotional attachment to the country but also the individuals within each of the centers.” Castro-Valdez volunteered alongside nine other WCU students, most of whom were education majors. Two faculty members from the Special Education Department, Professors Dawn Patterson and Beatrice Adera coordinated and led the trip. Though Castro-Valdez didn’t receive any class credit for her experiences, she gained valuable life-lessons while volunteering in Guatemala. “I loved it. I enjoyed it a lot,” she said with a wide grin. Castro-Valdez expressed her gratitude for the scholarships she received, including the Global Rams Initiative Scholarship. According to Scholarship & Award webpage of WCU’s study abroad cite, the Global Rams Initiative Scholarship is awarded to underrepresented minority students participating in study abroad programs. The study abroad’s online program directory states, “This scholarship is only open to Underrepresented Minority Student (URM), as defined by the [The Education Trust] Access To Success,” which includes students who identify as Black, Native American/Alaskan, Latino/Hispanic, and/or Hawaiian/Pacific Islander. Thanks to the Global Rams Initiative Scholarship and other study abroad scholarships, Castro-Valdez was able to travel to Guatemala with all of the costs covered. 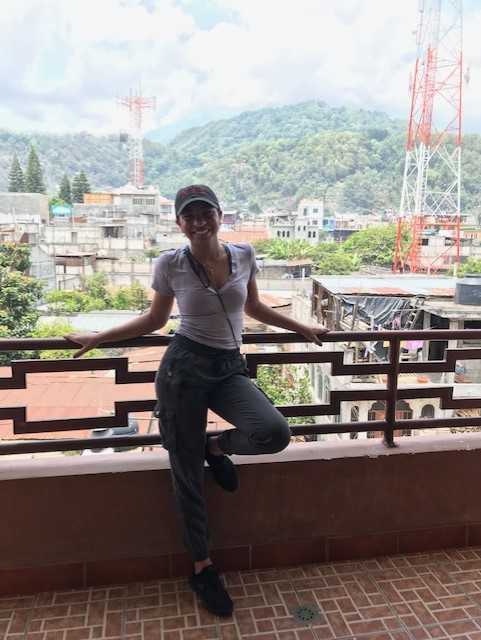 Originally from the Dominican Republic, Castro-Valdez stated she is no stranger to traveling, although she had never visited Guatemala prior to her study abroad experience. Castro-Valdez went to three different locations in Guatemala as part of her study abroad experience, including Antigua, Quetzaltenango and Santiago Atitlán. When describing the program, Castro-Valdez stated, “Basically the program was about helping different schools that had students with disabilities,” both physical and intellectual. According to Castro-Valdez, a stigma exists in Guatemala surrounding children with special needs. During her visit, some children with whom she interacted had been abandoned due to superstitions linking disabled children and the devil. Other families Castro-Valdez met felt embarrassed to have a disabled child and attempted to hide them from the public eye. Castro-Valdez said, “The first school we went to we helped the teachers teach,” but sometimes Castro-Valdez arrived early in the morning and helped students with their personal hygiene. Castro-Valdez noted that oftentimes “the teachers help them brush their teeth” in addition to conducting academic lessons. The interview ended with Castro-Valdez recalling one of her favorite moments of the trip: “My favorite part about the trip…when we were with the kids, they grew so much love towards us … once we were leaving they started crying.” Castro-Valdez continued and said the principal of one of the schools gave the WCU students and professors personalized certificates as tokens of their appreciation. “All of the students on the trip got so emotional,” she said as she recounted saying goodbye to the Guatemalan students and teachers. “Honestly, I don’t really cry much, unless it’s really touching…but a tear fell out,” Castro-Valdez said, reflecting on the sweetness of the people she encountered during the fourteen days. When asked if she would consider returning to Guatemala as part of the same service-learning program, Castro-Vasquez said, “I definitely would.” She added, “A lot of us loved it so much. I would honestly do it again … I recommend [the trip] to anyone.” After graduating this May 2019, Castro-Valdez plans on pursuing her masters degree in criminal justice through West Chester University’s accelerated masters program.